Bill and Mike Reynolds with contributions from Rick Wu, Mia Jorgensen and Nikki Reynolds. As we all know, America stands for freedom. Yet, for over thirty years American citizens, veterans, especially combat veterans, have questioned America's purpose of sending its young men into a war zone so many miles from our shores and for so many years without officially declaring war. Was it worth it? Why did Uncle Sam send us there? So many young American soldiers died � why? So many Vietnamese people died and suffered great losses � why? What good came of it? Scholars and historians all over the World continue to ponder these questions. However, my purpose here is to offer my own personal view and perspective of "The Good" that was borne out of the misery and despair suffered by hundreds of thousands of people on both sides of that conflict. My story begins with this photo taken on September 18, 1999. 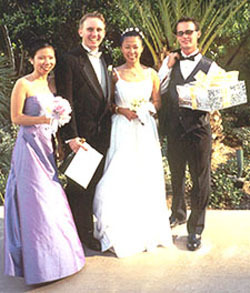 My Son, Michael � my one and only Son - is pictured here with his lovely bride, Nikki, who is of Chinese descendents, but was born in Saigon. Also pictured are Nikki's bridesmaid, her sister Mia, and Mike's best man and best friend, John. Until Mike met Nikki, I never really believed it was possible that any good whatsoever came out of the Viet Nam War. Had it not been for the United States sending it's troops there, it's reasonable to conclude that Ho Chi Minh, his North Vietnamese troops and the Viet Cong would have simply taken over South Viet Nam rapidly and with ease in the early 1960's. If this had been the case, the South Vietnamese would not have had the chance to see, learn or been exposed to the American influential political power, way of life and its culture. Without this exposure or direct experience with the western world, the people of South Vietnam may not have ever thought of leaving Vietnam to seek a better life. Because the American troops were in fact stationed in South Vietnam, their presence had indirectly introduced the American way of governing, its life style and its culture to the local people. As a result, the South Vietnamese people gained a sense of what the west was like. Realizing the western world had much to offer, many people risked their lives, and some even lost their lives, in order to escape Vietnam. Without the American involvement in Vietnam, many of the Vietnamese people now in the U.S. may not have ever been able to experience the American lifestyle or familiarize themselves with our diversity, our culture, and most importantly � our Freedom. So, at the conclusion of the War, thousands upon thousands of South Vietnamese promptly escaped the Communist grip by whatever means available and traveled to many countries, including the United States. It was during 1978, that Nikki's family reached a very difficult decision: enable their children to leave home and seek the freedom and opportunities they had come to realize the west had to offer. 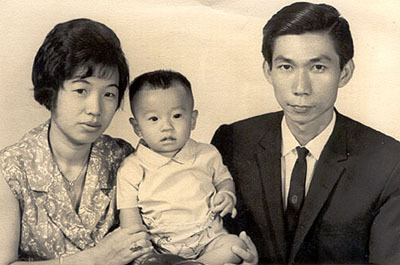 The elders of Nikki's family, led by her Uncle Ming, pooled their money and purchased fare for Aunt Wendy and her son Kevin, Aunt Julie, Rick, Reid, Nikki, Mia, and many other family members, aboard an old wooden fifty foot boat. 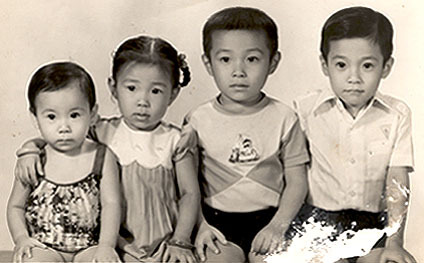 Nikki's younger brother and younger sister were too young to make the ocean voyage; hence the parents were required to stay in Saigon with them. Nikki was but six years of age and her Aunt Julie was only eighteen. During the darkness of night, these youngsters and 100 or more other people who had a similar purpose or ambition, crammed aboard the wooden craft and set out across the ocean into uncertainty. Enduring four days and three nights out in the open sea near starvation, encounters with piracy, heavy rains and high seas. 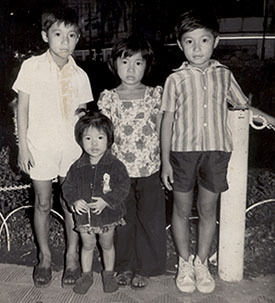 These people, sometimes known as the "boat people", miraculously landed on a Malaysian island beach, whereby government officials later arranged temporary quarters for them. This temporary shelter was their home for approximately nine months. All the while, their family back home had no contact with them nor had any knowledge of their well being or their whereabouts. 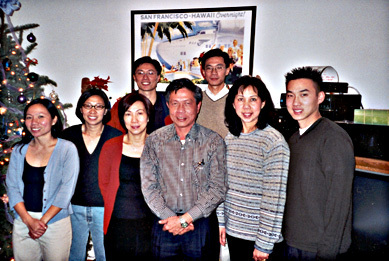 As a result of an international amnesty program, they were interviewed by U.S. officials and were granted passage and acceptance into the United States. They felt that they were the luckiest people on that tiny island! Throughout the 1980's, these brave young people devoted every effort to learning the English language and pursuing higher education. Their dedication and tireless hard work resulted in Rick, Reid, Nikki and Mia all earning bachelor degrees from University of Southern California, UC Santa Barbara, Santa Cruz, and Berkeley respectively. These accomplishments occurred with the strong guidance and watchful eyes of Aunt Julie and Aunt Wendy. Meanwhile, Uncle Ming, a successful businessman, unselflessly provided financial support. Today, these fine U.S. citizens lead industrious lives and are a model to all Americans. departure from Saigon in 1978. Christmas Day, 2001 at Mike and Nikki's home. Ried, Rick, Aunt Wendy, and Kevin. Untold thousands upon thousands of similar success stories could be told as so many others bravely embarked upon treacherous journeys to pursue better lives. Yes, 58,220 Americans lost their lives � but it was in pursuit of preserving freedom. This is what America stands for � this is what Americans have always fought and died for and freedom is what Americans will always fight and die for.